Next week (Monday 24 - Friday 28 September) Doug is feeling increasingly pushed out as Ste's attention is constantly focused on Brendan. Ste tries to make it up to his boyfriend, but as they're about to spend the afternoon together the phone rings - it's about Brendan. 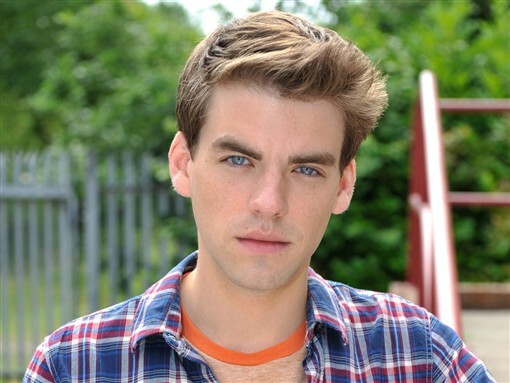 Enough's enough and Doug makes a life changing decision - will he walk away from Hollyoaks? A well-meaning genuine guy with a shady past who is trying to find a happier life. We both have terrible American accents. Mercedes McQueen: she's a devious little lady! Just under two and a half years since my first day. What's been your favourite scene to shoot in Hollyoaks? Filming the white water rafting scenes in Bala, Wales for last year's Hollyoaks Later. Filming the bridge sequence for the Boxing Day 2011 episode. I have never been wetter or colder in my life, but the material was great so I clung to that. There's so many. Ashley Taylor Dawson who plays Darren is a dream boat and he knows it. And Bianca Hendrickse-Spendlove always gets compliments from me because I ‘lub' her. I'd rather spontaneously combust than use my job to skip a queue. My friends do it though! Who's your best mate in the cast? I love so many of these guys so this is a hard one, but not really, it's Rob Norbury who plays Riley. Who's the worst in the cast for inappropriate laughter? I love Stephanie Davis, but you can hear that girl from the moon. No joke. Who's the worst for forgetting lines? What's the best thing about being in Hollyoaks? Being employed as an actor which is something I've wanted my whole life. Living here alone and very far away from my family in Brooklyn, NY - hands down, no question.